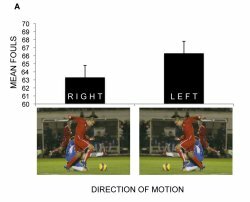 Soccer referees may have an unconscious bias towards calling fouls based on a play's direction of motion, according to a new study from the of University of Pennsylvania School of Medicine. Researchers found that soccer experts made more foul calls when action moved right-to-left, or leftward, compared to left-to-right or rightward action, suggesting that two referees watching the same play from different vantage points may be inclined to make a different call. The study appears in the July 7 online edition of PLoS ONE. "The effects are impressive considering that left-moving and right-moving images were identical, with the only difference being that they were flipped along the x-axis to create right-to-left and left-to-right versions," said lead researcher Alexander Kranjec, PhD, a post-doctoral fellow in the Neurology Department at the University of Pennsylvania School of Medicine. "If the spatial biases we observed in this population of soccer players have similar effects on referees in real matches, they may influence particular officials differently: referees on the field will more frequently be in positions that lower their threshold for calling fouls during an attack, compared to assistant referees working the lines." In real matches, referees and linesmen tend to be exposed to different quantities of right-to-left or left-to-right attacking plays, as referees employ a system to help them cover the field efficiently. Referees are encouraged to use a diagonal patrolling technique, choosing to run either a left or a right diagonal, while the assistant referees are tasked with running the sidelines. Based on this study, the left diagonal system would favor the offense (viewing more attacks from right-to-left), and the right diagonal system would favor the defense (viewing more attacks from left-to-right). Given the relational opposition, the authors suggest that referees should avoid switching diagonals at halftime. "There could be an unfair advantage if one team goes into halftime with a lead and the referees switch to a right diagonal system in the second half, favoring both defenses," said Dr. Kranjec. "However, because referees viewing leftward action may be more likely to see a foul when no foul was actually committed, as seemed to be the case when the referee disallowed what should have been the US team's third goal against Slovenia, the bias could work against the offense sometimes." Study participants called approximately three more fouls when images of soccer plays where viewed from right-to-left (66.5 fouls) compared to mirror images moving left-to-right (63.3 fouls). Participants were statistically more likely to call a foul when seeing a right-to-left attack. Previous studies suggest that similar directional effects are reversed in populations that read right-to-left languages, but other populations (e.g. Arabic or Hebrew readers) would need to be tested directly to see if the effects reported in this study correlate with reading habits.